Where Do You Find the Baseball Gloves? "So where do you get the gloves?" 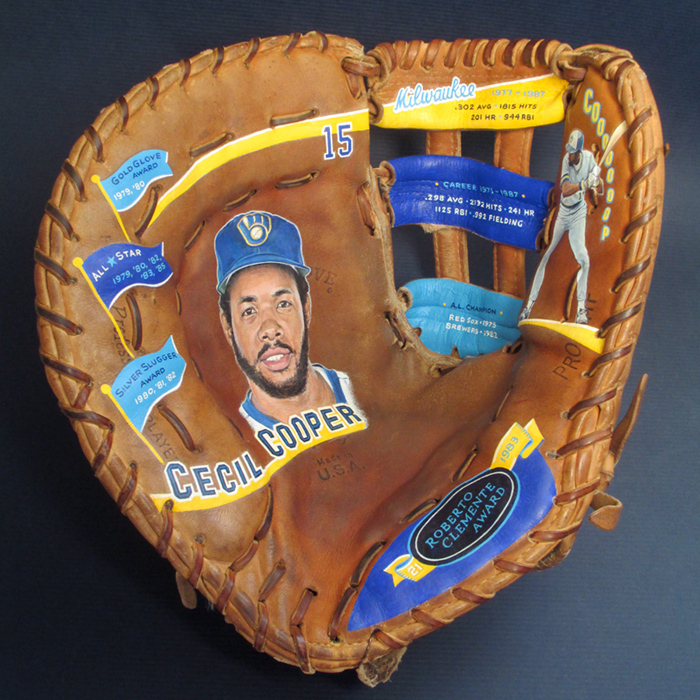 It's usually one of the first questions people have when they see a baseball glove painting. That along with, "How do you choose which gloves to use?" Let's answer the second question first. 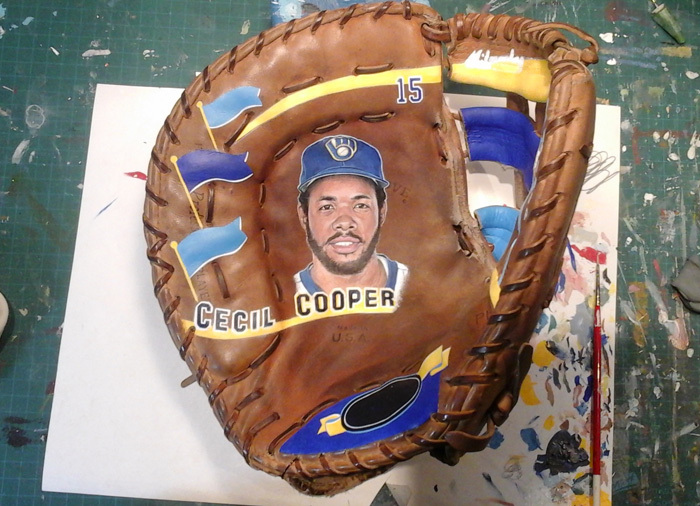 My biggest aim is to choose gloves that are from the same era as the player I'm going to be painting. It's a small way to help the painting connect us to the player. A way to get a firsthand sense of the game back then. It's a leather time machine to baseball's past. The right glove creates an instant sense of place. It gets us quickly on the path to creating an emotional connection with the art. Keeping along that path, if the player was left-handed, I'll seek out a glove that goes on the right hand. Catcher or Firstbaseman? Let's find a mitt that fits! I comb through old photos in my baseball library and via Google to find images of the player wearing a glove and try to identify the manufacturer and the style of the glove. This is an interesting part of the process but can take a few innings, so to speak. For my Jackie Robinson painting, for instance, I found a 1940s Spalding glove that looked similar to one in the Hall of Fame said to have been used by Robinson. Once I've got a grip on the era and style, I dig into my sources to find the gloves I'm after. This is when prayers are made to the glove gods and fingers are crossed. I find them via antique dealers, at sports memorabilia shows, on ebay and at various secondhand shops. My top sources for the best gloves are antiques dealers who usually trade in all sorts of vintage sporting goods, uniforms, balls, helmets, bats, you name it. Some of them supply Hollywood when sports movies are made. I've had the good pleasure of meeting a couple of them. And they know what I'm looking for. I do have some criteria when I'm scouting out gloves. 1. I prefer to stay away from gloves that are inherently collectible on their own. 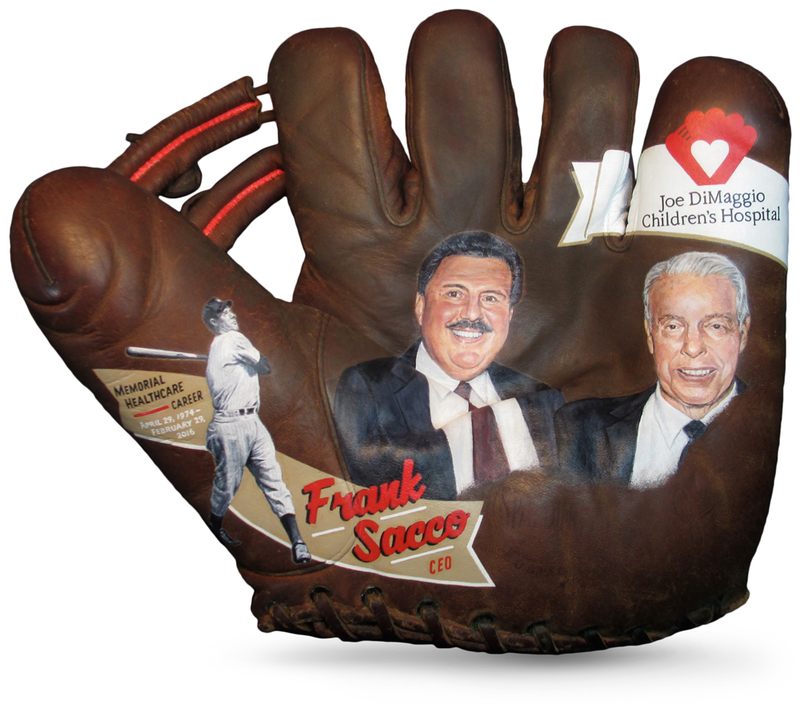 There is a great big passionate group of vintage glove collectors out there. Plenty for me to paint on without treading on their ground. I don't need immaculate baseball gloves. They're great when I find them. But the ones with dry leather from years of neglect are often perfect. Un-oiled leather accepts paint very well and makes for a great painting surface. 2. Of course, I need to find gloves that have a bit of space for a portrait. 1940s Split-finger gloves (no leather connecting the tops of the fingers) and some post 1950 fielders gloves are probably my favorites. 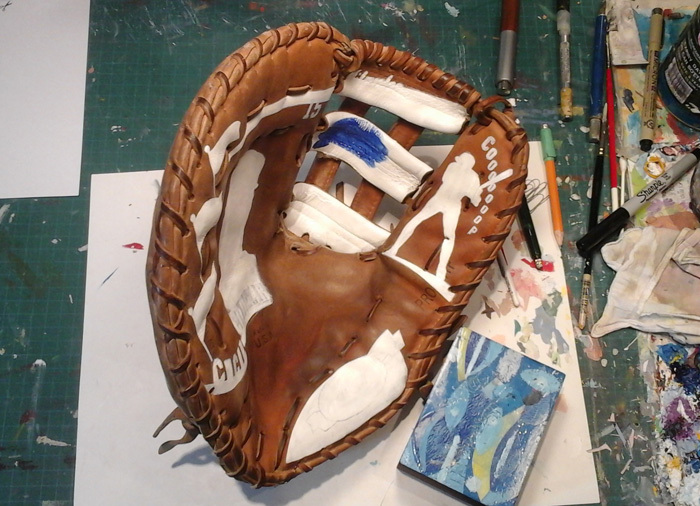 And Firstbase mitts and catchers mitts typically provide lots of uninterrupted painting places. 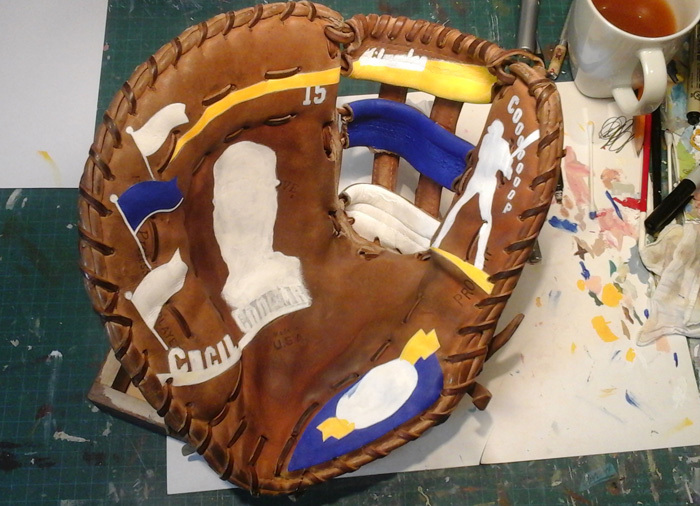 The mitt for my Hank Greenberg painting nearly designed itself, giving a wonderful almost framed area on the back to portray him taking a big swing. Come the 1960s, stitching is all over the place on gloves and tougher to find adequate spots for the design. But then necessity can drive the creativity. 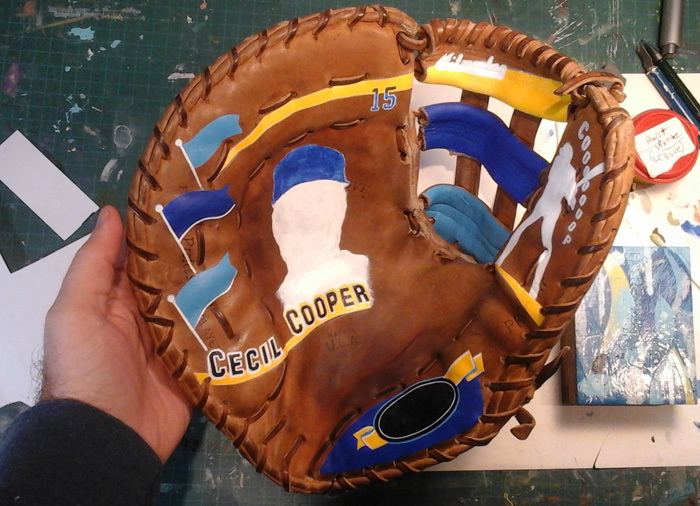 Lack of space is one reason why I started painting across multiple fingers on gloves, like on my painting of Willie Mays. 3. Signature model gloves can cause identity crisis. 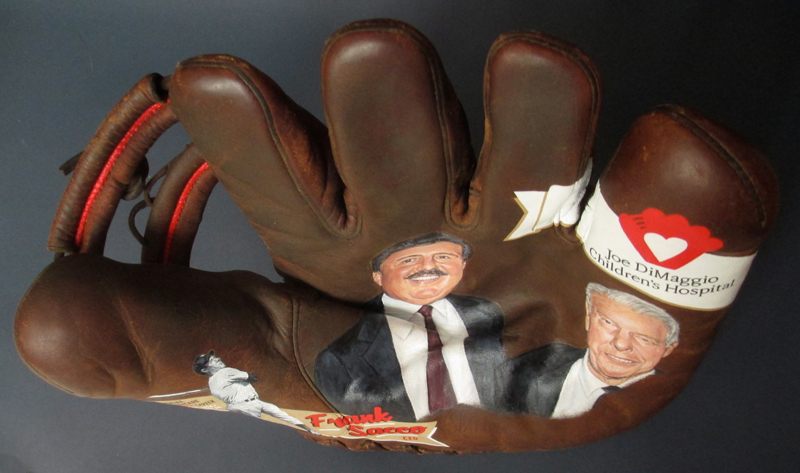 Wouldn't want to paint a Roberto Clemente portrait on a Tony Oliva signature model glove, for instance. Lots of times, older gloves are so worn that even when it had a signature stamped on it, the stamping is barely visible. I can use these usually. Other times, when the planets line up and I find a beautiful glove that is actually a signature model of the player I'm going to paint, shouts of joy can be heard in the studio. 4. Size of gloves can be an issue. Lots of gloves out there that were made for kids. Many gloves from the 30s or 40s that I get seem small for an adult by today's standards, even though I don't believe they were initially intended for kids. Styles change, equipment advances, and the default setting in the studio is to go with what looks best. 5. Flat gloves are much easier to paint on that folded gloves. But once we get into 1960s and more recent gloves, except for catchers mitts, folded gloves or deep pocket gloves are the norm. A bit more challenging for the artist but can result with some fun paintings. 6. Pricing is all over the map on used gloves, depending on who is selling, signature model, condition, etc. I strive to keep the expense to less than $100. Worth every penny when they are the right fit, so to speak. Selecting split finger gloves and catchers mitts at memorabilia show. After all that sometimes there are still duds. It's not uncommon to purchase a glove and realize it just won't work after all. Cracked leather, a big name written on by an earlier owner, or much too fragile. Or just ugly. 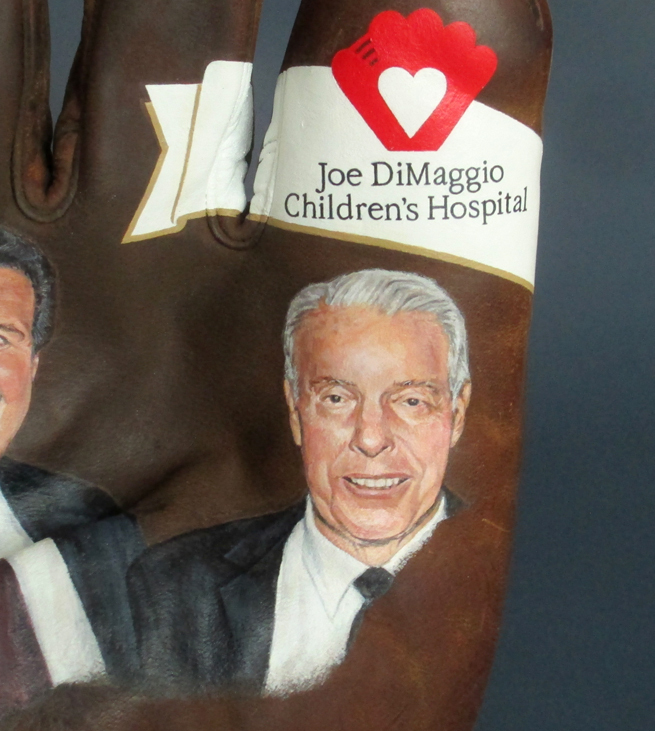 Finally, sometimes a collector sends me their glove to use for a special painting. It's an honor to be trusted with a personal item such as a baseball glove. I've been sent a glove with Hall of Famer Cal Ripken Jr's signature on it (although, ironically, I was not painting him on it). I don't take this responsibility lightly and am very careful with collectors' gloves in my possession. When it's all said and done, it can often take a bit of hunting to research and find the right glove, but that can be half the fun. It's a great feeling to give vintage gloves a new life, a starring role in a new artwork and a new story.